WASHINGTON (CNS) — Hispanic Americans give a nearly 5-to-1 edge to Democrats over Republicans as the party more concerned for them in a Pew Research Center poll released Oct. 10. In the telephone survey of 1,507 adults, 54 percent favored the Democrats while only 11 percent named the Republicans, whose historic high of support from Latinos was 12 percent in 2011. Also finishing ahead of the GOP in the poll was the 28 percent who said there was no difference between the parties. In the presidential race, Democratic candidate Hillary Clinton has a 3-to-1 margin among Hispanics over Donald Trump, the Republican nominee, 58 percent to 19 percent. Libertarian Gary Johnson has 10 percent support, while Green Party candidate Jill Stein tallied 6 percent. Among Hispanic Catholic registered voters, the Clinton edge is even wider, 69 percent to 15 percent for Trump, according to the poll. Clinton finishes ahead of Trump, 47 percent to 37 percent, among evangelical Hispanics. But Trump falls to fourth among Hispanics with no religious affiliation, with just 7 percent support. Among these voters, Clinton garners 47 percent, Johnson 20 percent and Stein 13 percent. The interviews were conducted Aug. 9-16 and Aug. 23-Sept. 21 — before the presidential debates, before the near-daily release in October of WikiLeaks emails attributed to Clinton aides, and before the surfacing of a 2005 tape of Trump making vulgar and lewd comments about women. Following the leak of the tape, several women have alleged Trump groped them years ago, but Trump and his aides deny the claims. Lopez teased out Catholic data for Catholic News Service not included in the report. Catholic Hispanics identify with the Democrats far more than other groups, 61 percent to 9 percent, with 24 percent saying there’s no difference between the two major parties. That percentage is the lowest recorded by any group. Evangelicals tilt 41 percent to 23 percent Democratic, with 29 percent saying there’s no difference, while unaffiliated Hispanics give Democrats a 47 percent to 6 percent edge, with 42 percent saying there is no difference. Compared to Hispanic evangelicals and those with no religious affiliation, Catholics are the most satisfied — actually the least dissatisfied — group when it comes to the direction of the country. Fifty-one percent of Catholics are dissatisfied and 42 percent say they are satisfied; among all Latinos — Pew uses the words “Hispanic” and “Latino” interchangeably — 57 percent say they’re dissatisfied and 37 percent say they’re satisfied. The percentage of Catholic Hispanics who say they are “absolutely certain” they will vote this year are precisely at the overall percentage of Hispanics — 69 percent. Religiously unaffiliated Latinos are at 72 percent, and evangelicals are at 67 percent. 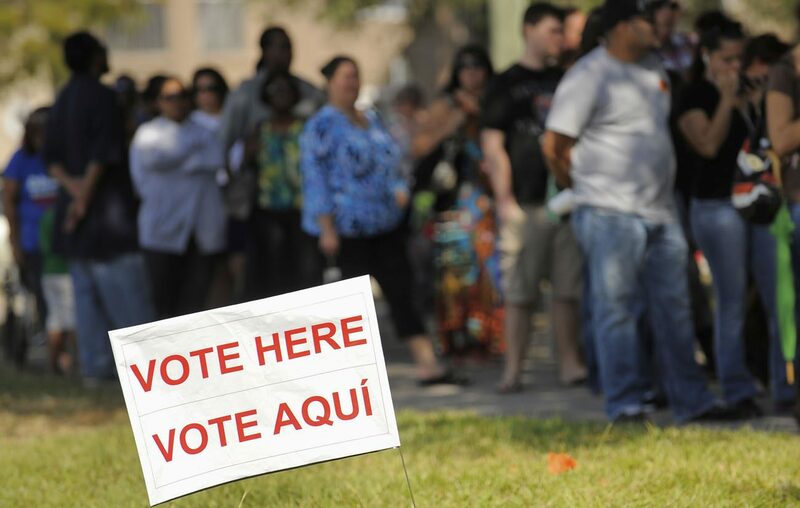 At 22 percent, Catholics have the lowest percentage of first-time Hispanic voters in November. Thirty percent of unaffiliated Hispanics are first-time voters; and of those who are evangelicals, 26 percent of first-time voters. The average number of first-time voters among all Latinos is 24 percent. Asked about issues of concern, three warranted the concern of more than three-fourths of all Hispanics surveyed: education, 83 percent; the economy, 80 percent; and health care, 78 percent. Hispanic Catholics identified the same three issues as their top priorities, not only in the same order but with almost exactly the same percentages, with education being listed by 84 percent of Catholic respondents. Three other issues garnered support from at least two-thirds of all survey respondents: terrorism, 73 percent; immigration, 70 percent; and how Hispanics are treated, 69 percent. Gun policy finished at 61 percent. Trump’s comments on the campaign trail have been a source of conversation among Hispanics cutting across religious lines: 74 percent of Catholics, 73 percent of evangelicals, 76 percent of unaffiliated Latinos, and 75 percent of all Hispanics. “I do hear frequently, people supporting some on the Clinton side, and some on the outrageous comments that people hear from Trump,” said Norberto Martinez, a court liaison for Hispanic services with the Seventh Judicial Circuit of Maryland, which serves the Washington suburb of Prince George’s County. Martinez, who grew up in California, told CNS he believes Latinos are more politically active on the West Coast than the East Coast because of deeper U.S. roots. “In our region, you’ll find a lot of Central Americans who started (arriving) — very, very few in the Seventies, but the majority landed here around the Eighties,” Martinez said. “My neighbors in Mexico, they came in the Sixties.” Martinez’s own father first came to the United States as part of the “bracero” (Spanish for “manual laborer”) program, which ran 1942-64, with 5 million Mexicans working in farm labor over that period. Among Trump’s Hispanic supporters, there’s an even 49 percent to 49 percent split who say their vote is more against Clinton, or more for Trump. Among Clinton’s Hispanic backers, 44 percent say it’s more of a vote against Trump, while 55 percent say it’s more a vote for Clinton. There’s a 64 percent to 24 percent margin favoring the Democrats among Hispanics who identify or lean closer to Democrats, according to the poll. Of Pew surveys of U.S. Hispanics dating back to 2002, the narrowest margin was 49 percent-27 percent in the Democrats’ favor in 2006, which Pew’s Lopez attributed to then-President George W. Bush having been a popular governor of Texas, a state with a large Latino population, and his efforts at the time on immigration reform. Lopez noted that more than 800 of the survey respondents were registered voters. He said the number of registered Hispanic voters has risen from 23 million in 2012 to 27 million in 2016 to make up about 11.5 percent of the electorate, just behind the 12 percent figure recorded by African-Americans. All survey respondents were asked if they were U.S. citizens. For those who had replied no, they were later asked whether they had a green card or a similar document. Lopez said 8 percent said no — a rate he noted was lower than the estimated 15 percent of all U.S. Hispanics. The margin of error for the full sample of respondents is plus or minus 3.3 percentage points.